Come rain or shine this particular Saturday tamu (local market) will be held in the car park of the Giant Super-Market in Kolombong. This is ideal as all visitors are protected market from the elements for this market is held in the car park under the supermarket. The market is open to everybody and you can buy almost anything there. Most of the stall owners are local housewives who either have extra fruits from their orchards or homemade cakes for sale. Several of the sellers only come to sell their products at this tamu while some of them also have stalls at the Gaya street fair on Sundays in town. However the sellers are predominantly Locals from the area. There is always a good collection of fruits and vegetables on sale here with a number of stalls that sell house and garden plants. There is also livestock for sale and a couple of local medicine men and women who sell an array of locals' herbs to treat many common diseases, if you're game to try it. A selection of rice, both local and imported is sold here and traditional cakes also take pride of place. The variety of seasonal fruits and vegetables is always fascinating with many varieties of local Jungle products not commonly found at other markets. There are vendors who try to sell you various face creams and brands of make-up for a more beautiful you. 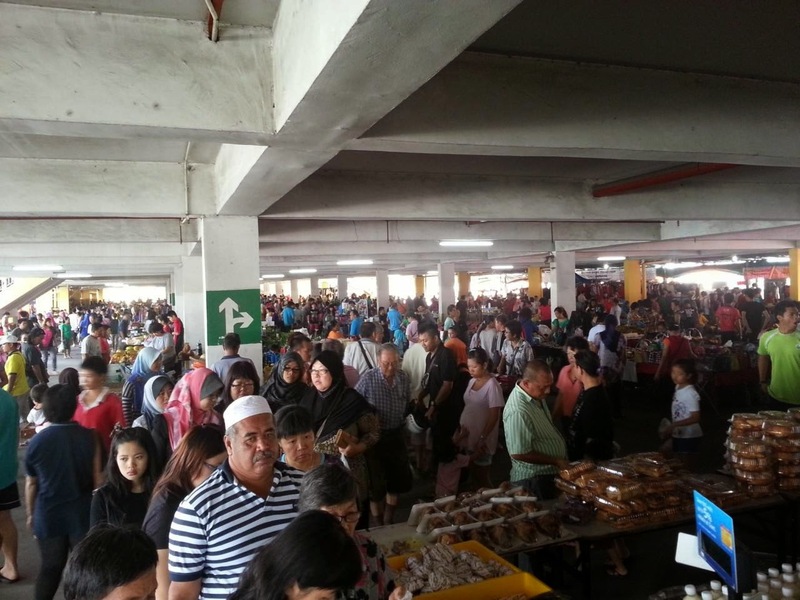 So even if this is rather a modern area within the city, the market or tamu as it is locally called, lives up to the tradition of various other tamu in more well known areas like Penampang or Kota Belud The Tamu has a long tradition of being a meeting place for the various tribes in Sabah. The word 'tamu' actually means, "meeting place", tamu are more common on the west coast of Sabah where people from the interior mountains with their products like rice, tobacco and other jungle products would travel down to the coast to trade with people of the coast who were mainly Bajaus and Irranuns. These coastal people would trade their salt, sugar (made from sugar cane which they grew) and of course their products from the sea. In the early days, these groups of the interior and the coast were at war amongs each other but would meet once in a week on a specific date to trade peacefully. There was usually an oath stone erected within the tamu grounds where each different group would have to lay down their weapons and take an oath to have a peaceful day before entering the tamu. During the time when Sabah was known as British North Borneo and under the rule of the British, the 'Tamu' was encouraged by the Government and used as a means to distribute government news and laws and it also enabled the various British district officer to meet up with the local people of their district, to hear about their problems. Today, as in the past, it is as much a market as a local gathering where traders from the surrounding areas come together to discuss the latest events. Visitors to the Giant tamu will find some of Sabah's handicrafts muddled up with home baked cakes, exotic, fruits, vegetables and electrical item from Taiwan. So if you're free on Saturday morning - do pay a visit to this tamu which is within the City and a great local Tradition open from (07:00 am to 12:00 noon).